The laptop has made it possible for us to work almost anywhere on earth; from the cramped quarters of a plane seat, to a relaxing beach. But away from the privacy of your office, you often want to keep prying eyes off your screen, which is why this No. 1 leather laptop bag from La Fonction is so brilliant. It transforms into a tiny mobile cubicle, letting you work with adequate privacy no matter where you set up your temporary office. 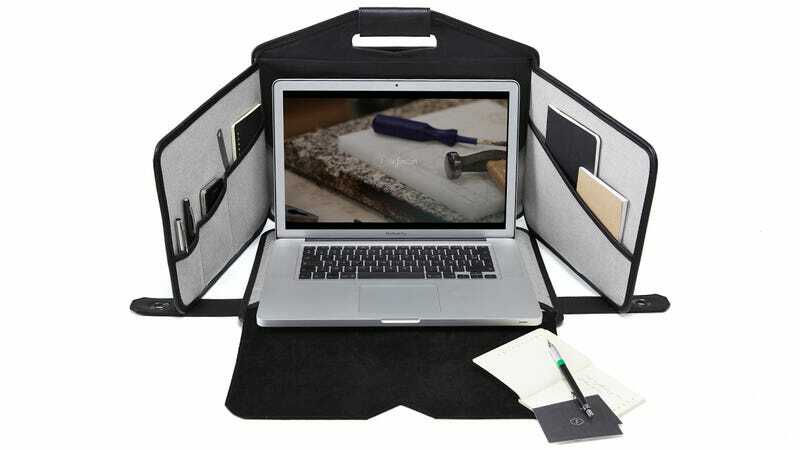 With enough capacity to securely store a fifteen-inch laptop using a set of elastic straps, and an external removable pouch that doubles as a mobile filing cabinet, the La Fonction No. 1 should be all you need to stay productive while you travel. And when deployed, you'll even find pockets for storing documents, pens, and even a photo or two of the kids.